Do I Need Anti-Malaria Tablets? Do I Need Anti-Malaria Tablets? Globe Trooper > Asia > Do I Need Anti-Malaria Tablets? Malaria is a tricky one. You can’t be vaccinated against it, but it can be cured. Yes, almost one million people die from it every year, but those who do, don’t have access to treatment. 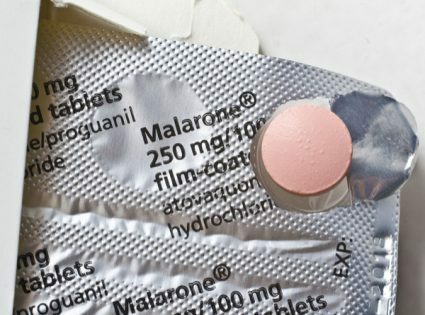 There are many ways to try and prevent malaria, but are these anti-malaria tablets really needed? Doctors will tell you, ‘Yes, yes, yes, you must’, but many travelers beg to differ. If you’re a hypochondriac, then yes, buy some anti-malaria tablets. Spare your fellow travelers the agony. Malaria is caused by Plasmodium parasites, transmitted from human to human through bites of a mosquito. The first two are the most common, unluckily. But not all mosquitoes can carry the parasite, only certain female mosquitoes can who bite mainly at night, especially at dusk and dawn. Do everything you can to not get bitten, within reason. Go nuts with insect repellents, spray them on your skin, on your clothes, everywhere. But don’t inhale them. Wear long sleeves and long pants at night. Burn pyrethroid or insecticide coils and candles. Also, use a mosquito net when you sleep if there are potential ambush zones in your room/tent/hut. But you don’t have to go crazy by changing your travel plans. Most doctors will advise you to take some sort of anti-malaria drug like the anti-malaria tablet if you plan to travel to Africa, Latin America, the Middle East, India or South East Asia. There are a few different types, none 100% proof, all with potential side-effects. Chloroquine was the most widely used anti-malarial, until recently when parasitic strains became drug-resistant. It is also the least expensive, best tested and safest of all the drugs. So, it can be used in conjunction with Proguanil in areas of drug resistance. But Mefloquine, Doxycycline, and Malarone are recommended if visiting an area known for drug resistance. All of these drugs can give you higher sensitivity to the sun, nausea, diarrhea, or a dull headache. Nausea especially can occur when you don’t take the malaria tablet with or after food. Slight hair loss and mouth ulcers have been occasionally reported with the use of Proguanil. Mefloquine has been found to cause vivid dreams and nightmares among some users. Doxycycline can cause abnormal tooth enamel, depression of bone growth and photosensitivity, so it’s not recommended for young children or pregnant women. If you’re not used to taking medication or vitamins daily, then sticking to a new regimen might be hard. The drugs are not really effective against infection if you forget a few days, but they will help you get better as most antimalarials are also used for treatment. I’ve read a number of travelers have been infected, even when they’ve been on a recommended regimen. So just because you’re on the drugs, doesn’t mean you can forget about all other preventative measures. Symptoms of malaria and their severity range. The classic symptom of malaria is the occurrence of sudden coldness and shaking chills, followed by fever and sweating lasting four to six hours, recurring every 1-3 days. Other symptoms include continuous fever, flu-like illness, shivering, headache, muscle aches, tiredness, nausea, vomiting, diarrhea, anemia, and jaundice. Basically, anything that traveling can cause anyway. Most people tend to show these signs between 10 days and 4 weeks after being infected, but some parasites can stay in the liver for months, even up to 4 years after being bitten. The most severe malaria usually arises 6 to 14 days after infection. Mauritius – Except a few rural areas where chloroquine is appropriate. Not that I’m trying to deter you from traveling to countries where there is a risk of malaria, (come on, I’m in India at the moment) I’m just making you aware. For more info, see the Travel Doctor website, a great resource. It’s your decision whether to buy antimalarials. They can be quite expensive if you’re traveling for an extended period, but they’re also usually a lot cheaper in areas affected by malaria, so you can buy some to start you off before you travel, and then buy the rest of your supply when you get there. Definitely get some pills if you’re trekking, camping or volunteering outside, in particular, near swamps and other water holes where mosquitoes can breed. Traveling can be unpredictable. When planning your trip you may want to consider individual disability insurance which provides financial support in the event of a disabling illness or injury.